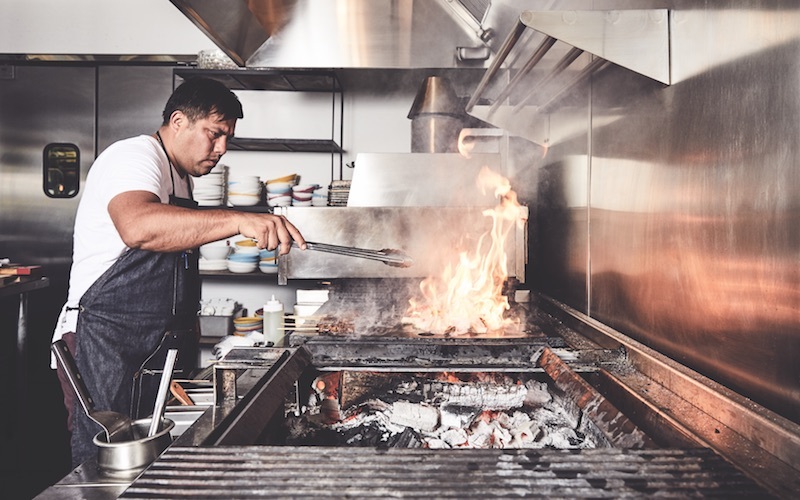 The temperature gauge on the charcoal-powered Josper oven is pushing 800 degrees a few minutes before dinner service at Rosaliné in West Hollywood. Ricardo Zarate hovers in the open kitchen, threading anticuchos. Traditionally grilled over coals at street-side stands in Peru, the skewered morsels of beef heart are so popular in Zarate’s homeland, they serve as a nationally ordained bite, suitable for lunch, a late-night snack, and any meal in between. But on Melrose Avenue in 2017, and in the hands of this chef, they’re the symbol of a comeback. Zarate arrived in L.A. in 2003, sent to help launch the first California venture of Sydney’s Tetsuya Wakuda. Even then the Lima native had an uncanny knack for legendary Nikkei (Japanese-Peruvian) cooking: his reverence for quinoa and corn (the birthright of any Peruvian) combined with a prowess for sashimi picked up during stints at London’s finest sushi spots. When his original plan didn’t work out, he ended up preparing hand rolls in Venice while opening Mo-Chica, a scrappy food court counter at Mercado La Paloma near USC. The compact menu offered earthy staples such as papas a la huancaina (steamed taters in creamy sauce), but what I remember most is how the inexpensive bowl of diced fish scattered with ribbons of seaweed, dried choclo kernels, and fiery leche de tigre dressing reprogrammed my idea of ceviche. Success came quickly, and within a few years he’d launch a total of four restaurants: a pisco-driven version of Mo-Chica, together with Picca, Paiche, and Blue Tavern. “I felt I was planting the flag for Peru,” says Zarate of the pressure he’d created for himself—and its eventual side effects. During a nine-month span in 2013, Zarate lost his restaurants in a series of jarring business reversals, compounded by the loss of his mother and brother. “I knew I was falling, but I didn’t know how much it would hurt,” he says. At 42, he’s returned with an airy dining room in the former Comme Ça space and a determined focus. Ever-smiling, he bastes the thin sections of heart (as pink as tuna belly) with a sauce that fuses soy, oregano, and the purring warmth of ají amarillo peppers. His cooking today forgoes some of its former literalism (those papas a la huancaina are gone) and instead centers on Peruvian cuisine’s core tenets. Most notable of all is fire. Standing immediately to the right of Rosaliné’s entrance is a veritable blacksmith’s forge: that blazing Josper oven, a long robata grill where he scores steaks, a perforated cast iron plancha ideal for searing yuzu kosho shrimp, and an open pit glowing with mesquite and binchotan charcoal that Zarate rakes into any implement showing signs of dropping below a pore-assaulting heat level. At these temperatures, cooking times become blazingly fast. As Zarate places the skewers on the cast iron, the strips of flesh sear on contact, the anticucho sauce sizzling into an instant tawny crust. He adds a dollop of herbaceous salsa bolstered with ground walnuts and crumbled feta. The creaminess underscores the leanness of the beef, and I notice how the oregano-infused soy has caramelized. Its deep flavor isn’t something a more marbled cut might reveal.